nVPN is a VPN service whose strong point is keeping you private and secure. The VPN service provider is tagged ‘trustworthy’ by most users who have tried the service seeking to be protected from the many prying eyes of the digital world. Let’s see how it performed during the preparation of our nVPN review. nVPN is a service the has no base in any specific Country since you will not find anywhere a registered company. Its 4 administrators are spread all over Europe, and they strive every day to offer a complete online security solution. I will give you more details on that later on in the privacy section. nVPN has some high and low points, and in this nVPN Review 2018, we will go into detail to help you get a better understanding of the VPN. Easy setup process with quick access (except PayPal which takes 2 days). Flexible payment methods & Bitcoin accepted. Quite expensive for a single server. nVPN offer 2 payment plans with a variation in the subscription period. When choosing a plan, a customer gets to select between a shared IP and a dedicated IP. This lets them determine how they want to manage their online connection. Shared IP: $6 per month or $40 a year ($3.33 a month). Private IP: $8 per month or $60 a year ($5 a month). There is also an additional fee for subscribers who need to enjoy unlimited server switch, a feature that will be explained in the servers section. It’s however important to note that PayPal payments for monthly subscriptions have a 2-day pending period before the payment is cleared. You can get past this if you subscribe for a 6 or 12 month plan, in this case the payment is immediate. If you want nVPN for just one month and need to use it right away, you may need to consider another payment method. 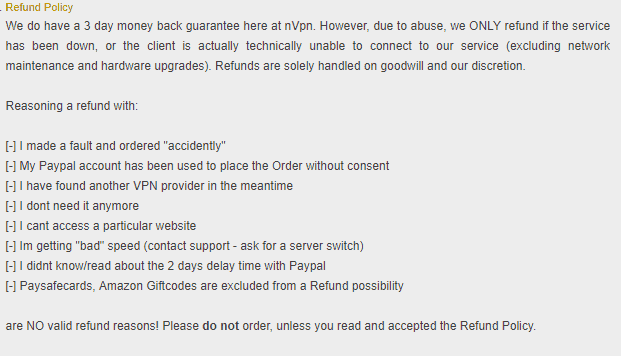 nVPN has a 3-day refund policy, though it applies only when specific requirements are met. If you have a closer look at their terms of refund, then you cannot expect to get your money refunded easily. Our suggestion to avoid any disappointment is to go through all TOS carefully before you make your final decision. nVPN has quite a number of attractive features. Our key highlight here is the port-forwarding feature that can be customized from the client area. nVPN offers even a Kill Switch function that keep your connection safe even if you leave your device unattended. In the case the VPN drops, the Kill Switch will automatically block your Internet connection avoiding any accidental data leak. Unlike other VPNs that use windows firewall or other solutions, nVPN has created a custom Kill Switch written in C++ and it performs very well. Included among the features you will find even a DNS leak protection tool. In terms of safety, nVPN scores very highly. Since its inception, it has been a VPN offering a strong level of security and privacy protection. In the development, the team factored all factors that can help prevent hacking, eavesdropping, government surveillance and other security and privacy concerns for interns users. Significantly missing is the PPTP protocol. However, the protocol is quite weak and therefore being left out doesn’t take anything out of nVPN. The Squid Proxy is a practical solution and its enabled by default. The protocol can be used by itself, or alongside OpenVPN. To encrypt your traffic, nVPN uses the 256-bit AES-CBC in OpenVPN. SHA512 is also used to handle authentication and 2048-RSA for handshaking. If you wish, you can also opt for the 128 bit Blowfish-CBC with SHA 1. This protocol offers less protection but its quite useful in situations where you require more speed than security, for example, when gaming. nVPN also protects you against Deep Packet Inspection (DPI). This is done through an additional layer of security that offers stealth to overcome DPI in strict-censorship countries like China and Iran. This security is set up using OpenVPN over SSL, and all customers can use it to overcome censorships. nVPN also has servers that are configured to support SSL encryption together with “sTunnel.” Further, the VPN allows you to set up your connection to use the TCP protocol with port 443. This helps evade restrictions put in place by workplaces, universities and schools. You can also use the member area to open ports. Such ports get forwarded from your computer, and so you won’t need to set up your router to do this. There’s an Anti Port Clash technology that protects you from clashing ports with other users. Honestly, nVPN offers so much in security than almost all big VPN names. If you are a technical guy focused on security and privacy, then this might just be the VPN for you! When it comes to privacy, operates differently than their competitors. The company is not registered in any Country but it is operated by 4 individuals spread over the eastern European region. According to nVPN, this solution greatly improve security since the company doesn’t exist in any Country and therefore cannot be touched by Governments. 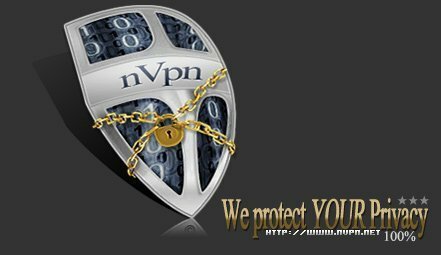 The nVPN owners are anonymous too and that should add even more to the privacy of the service. Their website doesn’t say much about their zero logging policy either but it is clearly explained in the TOS. They don’t keep logs of your IP addresses, timestamps or traffic. All third party requests are handled internally, and your details are never exposed. Further, the fact they accept Bitcoin and many other cryptocurrencies payments helps you improve anonymity. nVPN has a network comprised of 65 servers that are located across 35 countries, and with an IP pool of 5024 IPs. Their servers are super fast, and they do not have any form of throttling. However, before subscribing, you should understand their operation quite well. Though they have servers in quite a number of areas, you are restricted to only one server per subscription. Server switching is only allowed twice for free after subscription. After that, you will have to pay an extra amount for every server switch. However, every month you will have the possibility to switch server two times for free. To access unlimited server switch which is free in almost all other VPNs, you will have to pay an additional monthly amount. The reason behind this limitation is to offere an overall better service. Instead of focusing on free server switches, nVPN prefers to focus on having the server physically located in the Country instead of faking it changing the IP address details (as it happens to other VPN providers!) This aspect makes the nVPN less useful to people who want to unblock geo-restricted sites from other locations but very good if you don’t have this specific need. To get started with nVPN, you only need an email address to register. However, this might differ depending on your payment method. You start by ordering a plan, and then you will be sent a configuration file immediately. It can be downloaded from the client area. This file can then be used with any open-source VPN. 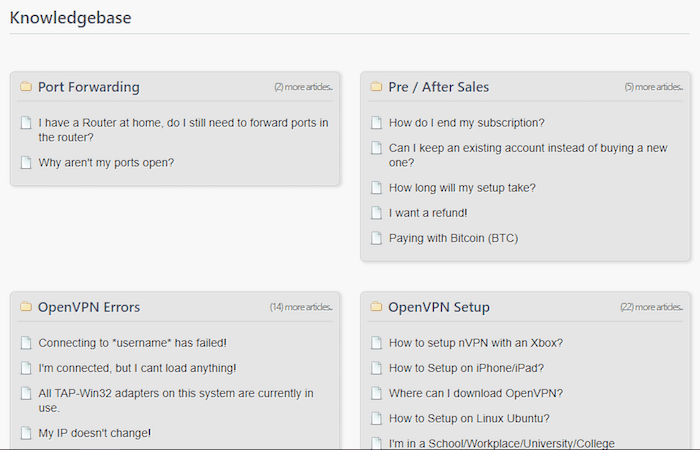 At the moment nVPN has clients for Windows and Android while the MacOS and Linux versions should be available soon. Your speeds generally depend on the VPN selected. However, using the OpenVPN protocol which is the industry standard, we were quite satisfied with nVPN speeds. The proxies are significantly faster since they do not encrypt traffic. If you are using data-intensive services like HD streaming or gaming, then these are your best friends. The sTunnel feature that nVPN provides lets you enjoy these proxy speeds, while at the same time securing you. That said, here is speed test of the VPN done with a connection of 40 Mbps. nVPN has a very good knowledge base and searchable FAQ on their website. It is divided into sections to help you get your answers faster. If you can’t find the help you are looking for, there’s also the option to contact the team via a ticket system. Tickets get usually replied to within a few hours, and sometimes even in minutes. However, depending on workload or time zone it may take sometimes between 12 to 24 hours.This is quite commendable considering that they only have a team of four people. After having a closer look at the VPN for this nVPN Review, we were left with mixed reactions. The VPN is very convenient for security-oriented users. However, the fact you can’t switch servers as you wish makes it less attractive for those of us who like to travel wherever we want to using our computers. Nevertheless, nVPN is a great VPN option if you just want to stay secure and anonymous while on the internet. If so, make sure you choose the server nearest to you for the best speeds.